My nephew, Luke is visiting from Australia at present, one of the brave visitors, happy to come in winter. We have been explaining to him that anything above -10° C is not really cold. It is actually perfect winter weather, not too cold to go out but cold enough that the ice on the rink isn’t melting and the snow isn’t turning to slush. Yesterday, however, when he was standing in the wind at the top of our local toboganning hill he asked whether the temperature there was actually cold? We assured him that yes, with the wind chill making it -19°C it was cold! Since he arrived he has skated on our rink in the park a few times, and is waiting for the canal to open so he can experience a canal skate complete with “beavertail” at the end. 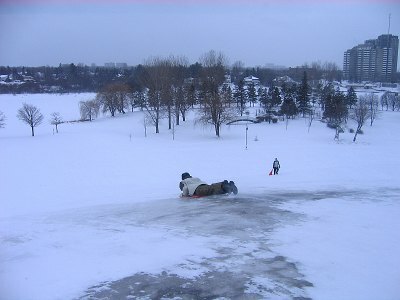 Yesterday we met a few friends at the hill and spent an hour or so tobogganing. Once they found the icy patches on the fast side they did away with toboggans and mats and just slid. Luke managed to take the record for distance on a toboggan. Finish! 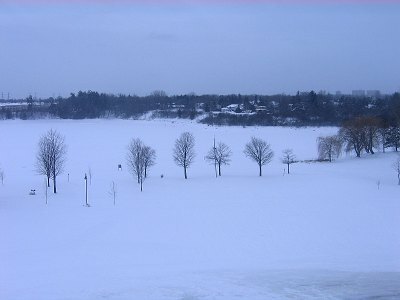 He is that little dot between the trees, which is actually quite close to the now frozen water’s edge. 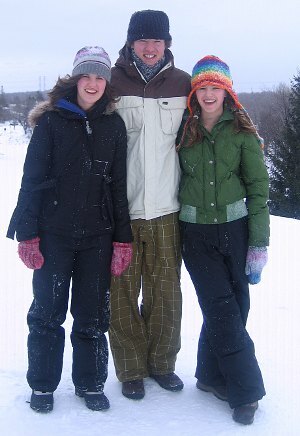 This entry was posted in Family, Sport on January 9, 2010 by Heather. “… is this cold?” Yes, it is! Furthermore, when compared to the overnight temperature in Melbourne, Australia last night of 33 deg C, we wonder whether whether we are on the same planet. The previous highest overnight temperature in Melbourne was in 1902 and it is expected that a new record may be confirmed today. What a happy and handsome trio they are. We are glad that you have turned on perfect winter conditions for Luke. I wonder how it ranks for him against his usual January activity of riding the waves on the south coast. Perhaps Luke may be persuaded to post a guest entry on your blog before he leaves.